Palmistry, most often associated with carnival fortune-telling booths and gypsy caravans, has been a popular means of divination for centuries. Some traditions state that the Brahmins of ancient India practiced the occult science as a means of determining the potential of their students. An old story has it that Aristotle (384–322 B.C.E.) discovered a treatise on the subject of palmistry that was written in letters of gold, which he then presented to Alexander the Great (356–323 B.C.E. ), who took great interest in examining the character of his officers by analyzing the lines on their hands. Many years later, this magical volume was translated into Latin and found its way to Arabian magi and to magicians in Europe. individual's life path can be foreseen on the lines that crisscross the palm. 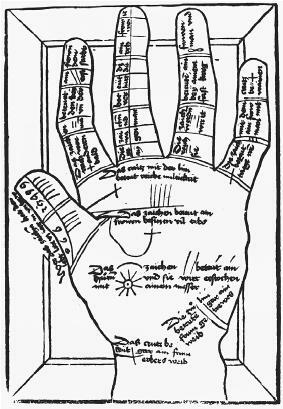 Palmistry is subdivided into three parts: chirosophy, the determination of the mystical significance of the various lines; chirogonmy, analyzing the overall shape of the hand itself; and cheiromancy, divining the future and/or past from the form of the hand and fingers and the lines and markings thereon. Some palmists concentrate on reading only the lines of the hand. Others include the fleshy mounts, fingernails, fingers, and even the wrist lines for clues to an individual's life patterns. There are a variety of opinions regarding which hand to read, left or right. Most commonly, the right hand is read in a right-handed person, and the left for a left-handed person. Traditionally, in a right-handed person, the left hand represents future potential, whereas the right hand depicts the actuality of their personality as it presently exists. For a left-handed person, this would be reversed. Other schools of palmistry state that in a right-handed person the subjective hand, the left, should be read first, for it indicates the natural inclinations and abilities of the subject. The right hand, the objective hand, predicts how far the individual will follow the pattern of life indicated by the subjective hand. In left-handed people, the right hand is subjective and the left is the objective. For a palmist, each part of the hand is associated with a planetary spirit. The mount or mound of Jupiter is located at the base of the finger of Jupiter, the forefinger. The mount of Saturn is located at the base of the finger of Saturn, the second finger. The mount of the Sun is found at the base of the finger of the Sun, the third finger. The mount of Mercury rests at the base of the little finger, the finger of Mercury. The mount of Venus is the fleshy part of the palm at the base of the thumb. The mount of the Moon is located in the thicker part of the side of the hand, directly beneath the mount of Mercury below the little finger. The major lines of the palm are the Life, Head, and Heart, which describe the basic personality traits as laid out in the palm. The Life line is the prominent line that begins at the base of the thumb (the mount of Venus) and runs up toward the finger of Jupiter—or, in other terms, the line that starts about halfway between the thumb and the forefinger and curves around the area of the thumb, ending usually near the base of the thumb, nearly at the wrist. The Head line begins at the start of the Life line, and the two lines should be joined together, just touching. Once palmists locate the beginning of the Head line about midway between forefinger and thumb, they trace its course across the palm toward the outside of the hand. The Heart line begins in the area of the mount of Jupiter at the base of the forefinger, then runs across the base of the other mounts to the edge of the hand. It is the first horizontal line in the palm. The line of Mercury, found beneath the little finger, is not present in many people's hands. The line of the Sun is located underneath the third (ring) finger. The line of Saturn, the so-called Fate line, is only found in about 40 percent of the population. This vertical line (s) runs from the wrist up towards the middle finger. The Girdle of Venus is composed of curved lines that will appear underneath the middle and ring fingers. The line of Intuition is a curved, crescent-like line that extends from the lowest part of the mount of the Moon to the mount of Mercury, located directly below the little finger. The lines of Affection or Marriage are located on the side of the hand under the little finger in the area called the mount of Mercury. The longer one spends studying the human palm, the more lines and markings one is likely to discover. There are "bars," short lines that cross major lines, indicating warnings of serious interference. There are "crosses" that represent periods of ill health, unhappiness, or problems at work. There are even small "stars" consisting of several little crosslines that reveal something extremely rare or unusual. One may also see "triangles" (ingenuity), "squares," or "rectangles" (signs of protection). 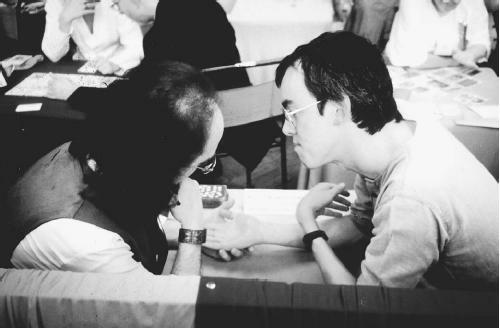 Although few scientists have taken palm reading seriously, on December 9, 2001, the Ananova Internet News Service reported that researchers at Barcelona University in Spain had announced the preliminary results of extensive research that indicated that intelligence can be predicted by palm reading. According to these scientists, people with learning disabilities have distinctive patterns of lines on their palms. Other research indicated that the lines on the palm can reveal a person's susceptibility to heart disease, autism, anxiety, and schizophrenia. Fairchild, Dennis. Palm Reading: A Little Guide to Life's Secrets. Philadlephia: Running Press, 1995. Hazel, Peter. Palmistry Quick & Easy. St. Paul, Minn.: Llewellyn Publications, 2001. "Palm Reading Shows Intelligence: Research." Ananova,December 9, 2001. [Online] http://www.ananova.com/news/story/sm_469117.html. 9 March 2002. Petrie, Joda. 7 Ways to Tell Fortunes & Predict the Future. New York: Award Books, 1968.
i have a mark on the middle of my palm a circle with some people say is the sign of the anarkist. can you help me find out.